Snrky: If it goes on long enough is TRUE != TRUE triggered in the code? If it goes on long enough is TRUE != TRUE triggered in the code? 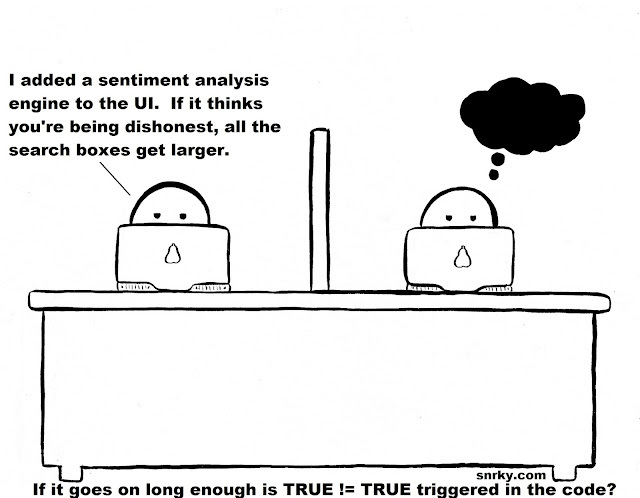 Snarky: I added a sentiment analysis engine to the UI. If it thinks you're being dishonest, all the search boxes get larger. Title: If it goes on long enough is TRUE != TRUE triggered in the code?